Inking It Up With Cathy: Lots of New Stuff! 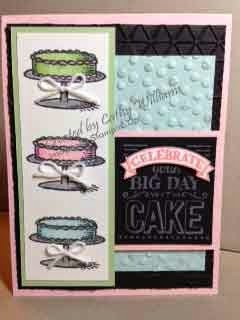 Sale-A-Bration's Big Day Stamp Set..
Lots of New Stuff! Sale-A-Bration's Big Day Stamp Set.. I recently held a "highlights" class to show off product from the Occasions and Sale-A-Bration catalogs. This card had a few items from each of the catalogs. 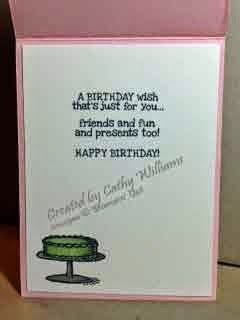 I am thrilled that Stampin' Up! came out with some lighter colors in the Blendabilities - just in time for spring! Here, I used the Soft Sky, Wild Wasabi and Pink Pirouette Blendabilities on the cakes. I used just the lightest and darkest pens. The sentiment is stamped on the new Chalkboard paper using the Rose Coral Chalk ink. Here's a funny story about this card. I often find inspiration from the talented cardmakers on SplitCoastStampers but with this card, I had a little bit of assistance from my daughter in Montana via FaceTime! I would come up with various ideas and hold them up to my iPad and she would comment. She is the one that came up with the baker's twine bows on the cake bases.